Whatchu Got In That Bag??? I don’t know about you, but by purse tends to become a dumping ground for ticket stubs, gum wrappers, old receipts, and millions of bobby pins. Eventually it gets to the point where I have more garbage than goods in my bag and I have to clean it out. Like last week, for example. So while I was cleaning and organizing the contents of my purse that day, I set aside some of the more common and/or interesting things I’d been carrying around. 1. Ticket stub for The Giver – I went to see this with my sister a few days prior. We’re both fans of the book and were pleasantly surprised at how well the story was adapted into a movie. 2. Quote Journal – I always carry around this little journal and a pencil and eraser. On the last few pages I keep a list of quotes and song lyrics that I’d like to turn into artwork, and the rest of the journal is used for drawing those quotes whenever the mood strikes me. 4. I use my DIY sunglass case to not only hold my sunglasses, but also pens, hair ties/pins, nail files, chapstick, etc. Basically anything that’s small enough to get lost under the piles of trash that accumulate between cleanings. 5. Bookmark – (remember when I made these? – one of my first little DIYs) I think I used this while I was reading Speaker for the Dead, but it fell out at some point. And instead of digging through my bag to find and replace it I just used a scrap of paper to mark my place… Laziness for the win! 7. Yes to Carrots chapstick – I got this in a Birchbox a while back. It’s magical. 9. The wrapper from my 3D glasses that last time we went to see Guardians of the Galaxy. Oh, and just because I love it so much and at least one person who reads this is probably interested in what my bag looks like… Here it is in all its catastic glory! “List of the Week” is a weekly segment where I write about (typically) 5 things pertaining to a particular topic. The lists can cover anything from favorite characters to most embarrassing moments to weird items I keep in my desk. Feel free to take part in the list making as well! It’s a fun and easy way to get to know people around the blogosphere. If you make your own list using this theme leave a link in the comments! Galaxy print is a fun and fashionable way to display your interest in science, love of sci-fi, or just your admiration of the beauty of our universe. This fashion trend has risen in popularity over the past couple of years and now everything, from dresses to leggings to footwear to scarves, can be found sporting this pattern. Here are 20 pieces of clothing, accessories, and shoes featuring beautiful galaxy prints that are perfect for showing off your love of the cosmos. From time to time I put together posts that cover the happenings of my shop, August Decorous Design Studio, so my lovely readers can stay up to date on any new artwork I’ve made, new products that have been added, and any other note worthy things. Think of it like a monthly newsletter, except instead of spamming up your email I spam up your newsfeed. 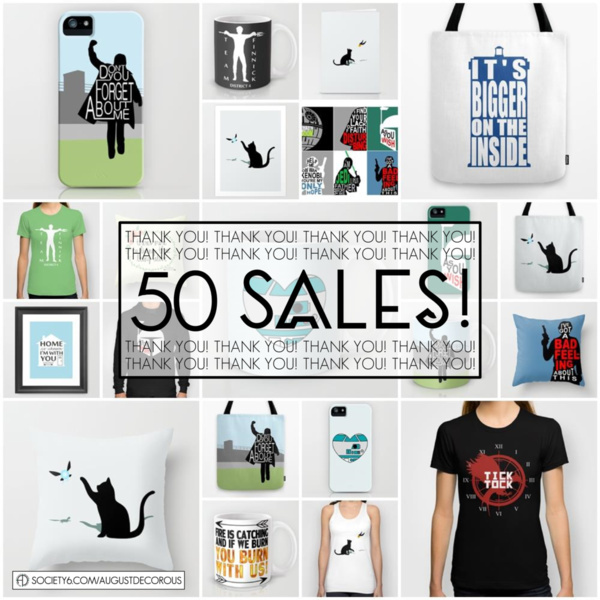 Last month the shop celebrated it’s 50th sale! 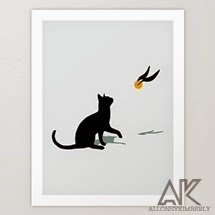 And a couple weeks ago it reached 100 followers on Society6. Yay! And thank you to all who contributed to either of those achievements. Society6 also added a few of my pieces to their “official” shop. I’m still not entirely sure what that means or how they go about choosing what’s worthy (I think it has something to do with the number of promotes you get? ), but it’s exciting nonetheless.